While world markets are teetering in a global banking meltdown, another banking drama is playing out in Switzerland that could end the way private banking has been done there for centuries. U.S. tax authorities have challenged long-standing Swiss banking secrecy laws, demanding that UBS AG release the names of 52,000 Americans suspected of opening secret accounts to evade taxes. The bank agreed to release client information on 250 U.S. citizens and pay a $780 million fine as part of a settlement, but that decision has put the entire Swiss banking system in jeopardy, according to Wharton faculty. “Swiss banking as we have known it is dead,” says Wharton professor of operations and information management Maurice Schweitzer. If the release of individual names triggers a run on UBS, the already fragile global banking system could be further endangered, according to Wharton finance professor Franklin Allen. “UBS is one of biggest banks in the world, and it’s not clear the Swiss government could save it. If UBS were to fail, this would be a huge problem.” He says U.S. authorities will have to engage in careful “brinksmanship” with UBS to balance their goal of apprehending tax cheats with the goal of preserving the stability of global finance systems. Secret banking in Switzerland dates back to 1713 when the Council of Geneva passed a law preventing banks from sharing client information. In the 1930s, after France and Germany tried to negate that ruling in order to prevent capital flight, the Swiss responded by making the release of banking information a crime. 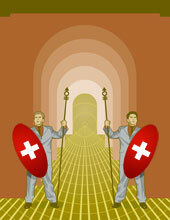 The system was reaffirmed in 1984 when 73% of Swiss voters agreed to preserve secret banking. The combination of its secret banking laws and a stable government gave Switzerland a competitive advantage in private banking, allowing it to attract capital from overseas. Today, one-third of the world’s total offshore assets of $7 trillion are in Swiss banks, according to Reuters. The current dispute pits U.S. tax law against Swiss law which still makes the release of banking clients’ names a crime — unless there is a specific client suspected of evasion and the client has the opportunity to answer to Swiss authorities. The U.S. Internal Revenue Service (IRS) has filed a civil lawsuit in U.S. District Court in Miami to force UBS to disclose the identities of U.S. customers who have secret Swiss bank accounts holding cash and securities valued at almost $15 billion as of the middle of this decade. According to Wharton finance professor Richard Marston, the U.S. takes tax evasion seriously, and the IRS has long been frustrated by the Swiss private banking system. The current action, however, comes in response to a concerted effort by UBS to solicit private banking clients in the United States. As a result, U.S. tax authorities threatened to indict the firm’s U.S. subsidiary, a move that would have endangered UBS’s sizable legitimate financial services business in the U.S. The bulk of UBS’s U.S. business is highly reputable, Marston adds. To much of the world, Swiss bank accounts are viewed as a tool for certain individuals — from ultra-rich Americans and Europeans to African despots and Russian oligarchs — to hide vast wealth. If the Swiss system were to collapse, Blume suggests, other havens, such as the Cayman Islands, might see an increase in business. He adds, however, that other countries willing to shield investors are not as stable, nor are they immune to the same pressure from U.S. tax authorities. Confidence in the security of Lichtenstein’s bank privacy laws was shaken last year when a former Lichtenstein bank executive handed over client names to U.S. authorities and testified before the U.S. Senate. Blume and other faculty members say the timing of the case against UBS has nothing to do with the current global banking meltdown or the recent election of U.S. President Barack Obama. They note that U.S. tax authorities have been building this case for some time, and it has only now come to point where it was ready to go before a judge. Blume isn’t sure. “I don’t know why the Swiss gave in [to U.S. demands] in the first place, unless there is a lot of behind the scenes pressure that you and I don’t know about.” Marston predicts that while the Swiss have the right to establish their own laws, the tax case will become a “serious tug of war” between two conflicting philosophies — one supporting secret accounts and the other opposing tax evasion regardless of the legal framework. He notes that the issue has not come to a head until now because more of the cases were isolated incidents in which an individual taxpayer slipped up and gave the IRS an opening. “It’s only when a major bank tries to create a program that builds up the secret accounts — that’s when you run into trouble,” he says. The U.S. and Switzerland are now on a collision course, according to Marston, although the U.S. will be reluctant to hurt its relations with an important European country. “It’s going to be difficult, and I’m not sure what will happen,” he says, “but when push comes to shove, I don’t think the Swiss will allow the general release of names” beyond the 250.